FAST asleep without a care in the world, Millie Mann looks a picture of contentment. 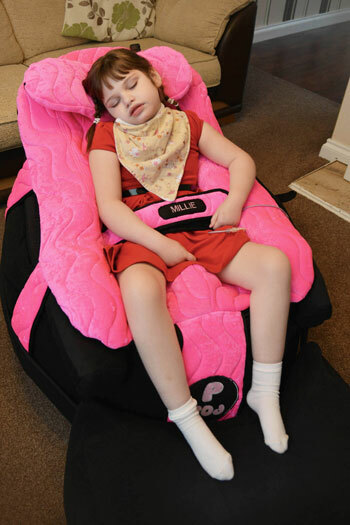 Safe and cosy in her new specially-adapted P Pod chair, the six-year-old can sit comfortably.Before she got her chair, Millie, who has cerebral palsy and epilepsy, had to lie on the sofa as she had outgrown her old special chair. “Millie had to lie on the sofa with one of us next to her to stop her rolling off,” said Millie’s mum, Aimee, 30, who lives in South Bank with her husband, Ian, 41, and their children, James, nine, Ebonie, eight, and Millie. “We’ve had the new chair a week and a half and it’s made such a difference to us. “She comes in from school and will go in it and just goes straight to sleep; I think if she had her way she’d sleep in it on a night. “It does make things easier – I can get on with the housework or tea and know she’s safe and happy. “I’m over the moon with it. The chair was given to the Mann family by local charity, Remembering Rebecca. The charity was set up by Gemma and Michael Sands, from Ingleby Barwick, in memory of their daughter Rebecca, who was just 21 months old when she died in her sleep in August 2010. She had been diagnosed with the rare brain condition lissencephaly when she was 10 weeks old. Remembering Rebecca has since raised thousands of pounds to help children and their families with neurological conditions. The charity has also helped Finley Cotterill, who has lissencephaly like Rebecca, by giving him a new P Pod chair too. The three-year-old also has another rare brain disorder, schizencephaly, as well as severe epilepsy and is partially-sighted. Finley’s mum Alexis Lapsley, 23, who lives in Skelton with her partner Darren Cotterill, 25, Finley and Albie, nine months, said: “He absolutely loves it. “He is out of reach of his brother now and he is at the same height as the sofa so he looks like he’s more part of the family. “He was always low on the floor before in his old tumbleform chair. “He’s much happier in his new chair; he’s so comfy and even falls asleep in it. Gemma, from Remembering Rebecca, said: “The P Pod chairs are amazing and offer a safe place for a child to rest and sit. “Since Finley and Millie have received theirs and their parents posted photos of them on the Remembering Rebecca Facebook page, we have had many comments and had two other applications for them.